When people travel to Lombok Island, they expect a more peaceful version of its more well-known neighbor Bali. Vivid colorful sunsets, soft sandy beaches, clear crystal waters, or even a hike to the top of the mighty Mount Rinjani are just a few activities that pop in your mind when you think of Lombok. However, this glorious island still has few other secrets just waiting to be uncovered. 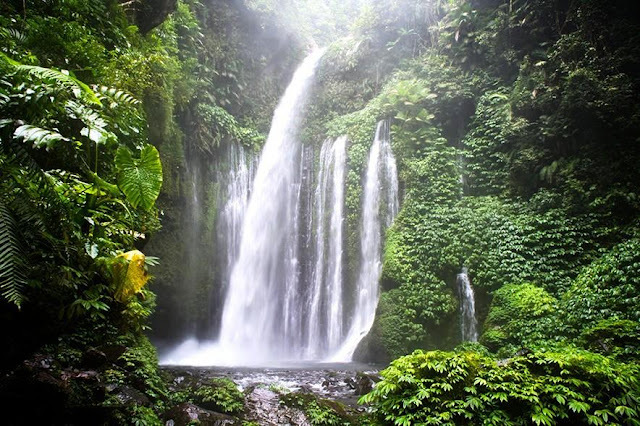 Many who come to the island fail to realize that Lombok hides some of the best tranquil waterfalls in the archipelago. Exploring waterfalls is the next best thing – not to mention safer – to exploring a jungle. The journey to a waterfall usually consists of a trek in the forest, best led by an experienced guide, that ends in a sight and sensation so fantastic the exhausting trip would be totally worth it. So the next time you're in Lombok, take time to explore the island further and visit one, if not all, of these incredible waterfalls during your stay. Tucked away in the village of Senaru in the island's northern Lombok Utara regency are two of Lombok's finest and most popular cascades, Sendang Gile and Tiu Kelep, located on the foot of the majestic Mount Rinjani. The village is located about a 2 ½ hour drive from Mataram, the capital of West Nusa Tenggara province. According to local people, the name Tiu Kelep is taken from the Sasak language. “Tiu” meaning pool, and “Kelep” means flying. Meanwhile, Sendang Gile’s name is taken from a legend which tells the story of a prince who was chased by a crazy lion. He ran into the woods and hid behind a waterfall, hence the name Sendang Gile. 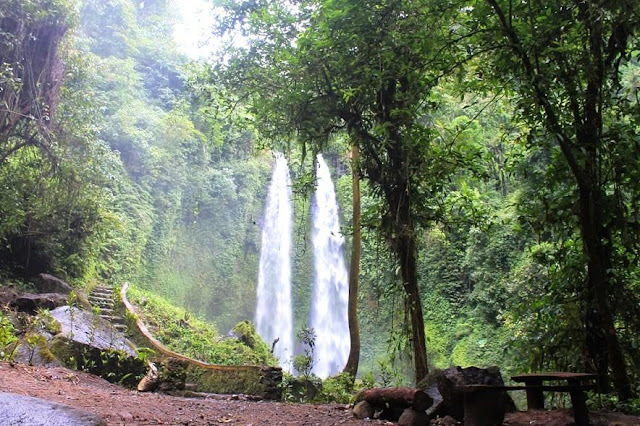 It only takes 15 minutes on foot from the entrance to view the marvelous Sendang Gile waterfall, which is a continuation of the Tiu Kelep waterfall. The clear path to the waterfall passes through a lush protected rain forest filled with towering tropical trees. Once you get there, you can enjoy the sight of the water crushing the rocks or swim in its cool crisp pool. If you crave a more adventurous trek in the woods that will lead to a more satisfying endgame, then venture further to Tiu Kelep waterfall. The journey to the second waterfall in the area takes around 45 minutes trekking through a lush forest. The bridge used to cross the river could also seem quite intimidating for those who are scared of heights. But the trip would be totally worth it as you come upon the majestic rush of water rushing around 45 meters down the cliff before crashing against the rocks on the bottom. 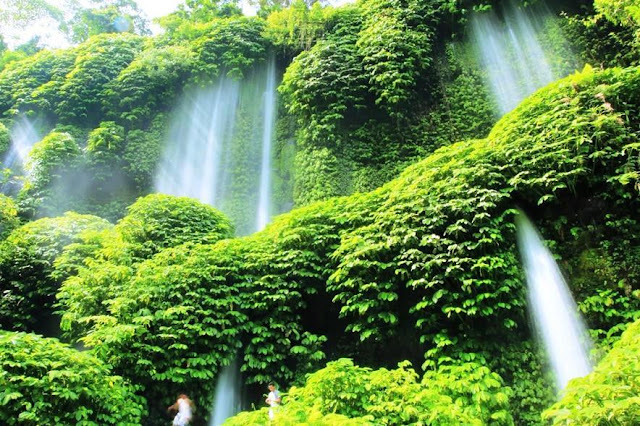 This is another cascade pair you must see when you visit Lombok. 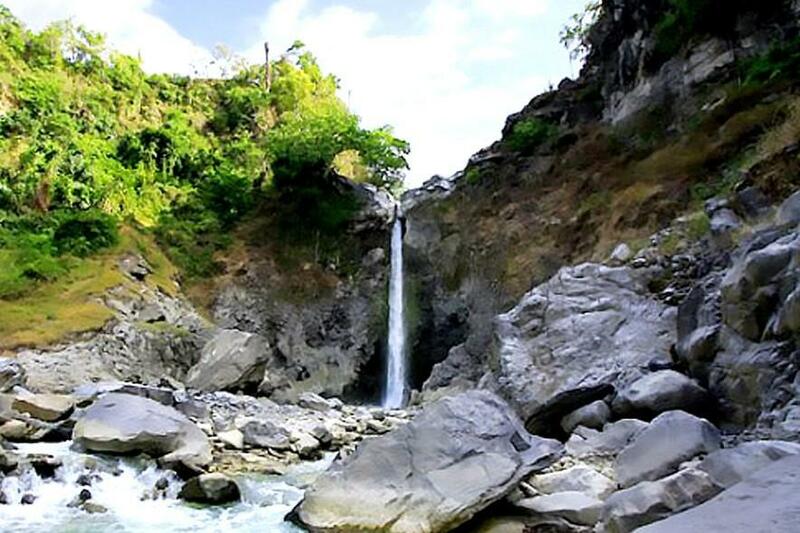 Situated in Central Lombok regency, just a one and a half hour’s drive from Senggigi beach, Benang Stokel and Benang Kelambu are waterfalls located only around one kilometer apart from each other. The unique must-see quality of these falls is that instead of being greeted by a sight of water pouring from a cliff passing through jagged rocks, you will see fascinating views of water flowing down among lush plants. The road is paved so this would be a fairly comfortable trek though still exhausting. You can also find some stalls on the sides of the road where you can buy small towels, drinks, snacks or even kaput rice. The name Benang Setokel means a bundle of thread. This waterfall consists of two levels and each isas high as 20 meters. The water comes from a river upstream on Mount Rinjani. Here, you can play and frolic in the pond that unites the downpour. Afterwards, journey to the stunning Benang Kelambu waterfall that consists of around two to three levels. The word “Kelambu” means curtain, named after the plants that frame the waterfall just like a window and curtain. Since the water flows directly from a water spring on Mount Rinjani, the water is clean and said to be safe to drink. Although Lombok has tens of amazing waterfalls, the Mayang Putek waterfall is the most unique one of them all. Why? Because its waters contain sulfur that locals believe to have healing properties because the water comes directly from Mount Rinjani. The 60 meter high waterfall is located in Bilok Petung village in the Sembalun district of Lombok Timur regency. 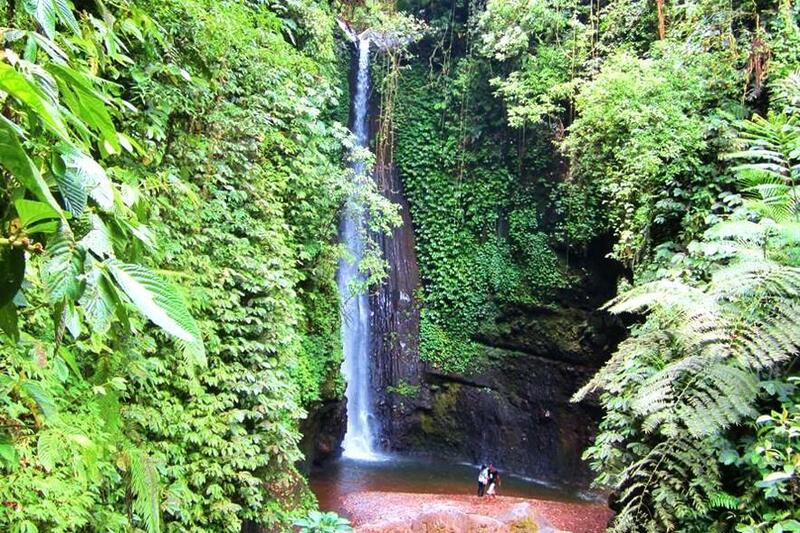 Like many names of Indonesia's waterfalls, the name Mayung Putek is tied to a local legend. Long ago at this location, a white stag was often seen bathing or drinking, hence the name Mayung Putek, which literally translates to meaning “White Stag”. The journey to the waterfall, however, is a trek of around 30 minutes of going down steps, passing through a hill and then across a river. Although the journey heading towards the waterfall seems simpler, the journey back is a bit more difficult. However, it would be totally worth it to feel the benefits of a nice sulfur bath that could supposedly heal your aches and pains and various other illnesses. Not to mention the unique sight of the “white stag”. Here is another one of Lombok's waterfalls believed to have special magical properties. Locals believe the cascade located on the foot of Mount Rinjani to the south of the Mount Rinjani National Park can heal various types of diseases and nourish the hair. Yes, locals believe that washing your hair in its waters will cure you from baldness or help you maintain your full lustrous locks. A haven for nature lovers, the waterfall stands some 30 meters tall and flows down to a narrow river and rocky place. After buying a ticket to enter the waterfall at the entrance gate, you will need to walk around 15 minutes for some 1.5 kilometers in order to get to the location. On the way to the waterfall, you will pass a path made from flat stones and about 180 stairs. Along the way you will come across many types of interesting plants and an animal or two, like a monkey or a deer. If you feel tired of walking, you can take a rest at one of the three berugak / gazebos sprawled along the path. However, it's best if you push through your exhaustion a little longer and rest at the gazebo located nearest to the waterfall. Here, you will be able to see a magnificent view of the protected forest spread across in front of you like a huge green golf course. If you're not thrilled of long treks and adventures through forests, than the journey towards the waterfalls above may seem unappealing. However, we do have a treat for those who crave the wonderful experience of venturing to a waterfall without the tiresome treks. Tiu Tedja is the perfect destination for lazers, the not-so-fit and people who want a simple trip to a glorious cascading waterfall. Unlike many of Lombok's other waterfalls, the journey to Tiu Tedja only takes around 15 minutes from the entrance through a soft trek of semi-permanent steps. Located in Lombok Utara (Northern Lombok) regency, this is basically a waterfall with the most friendly pathway in Lombok. “Tiu” means water while “Teja” means rainbow in the local language of Sasak. Therefore, this waterfall is guaranteed to give a sight like no other and the added perk of a rainbow if you're lucky. Another bonus? The pool is relatively shallow and perfect for swimming or splish- splashing around.